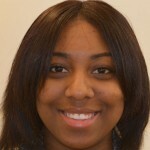 Ariel Harden is a senior undergraduate student with an emphasis in Human Genetics. She is currently pursuing her B.S. in biology from Spelman College. Ariel works with Dr. Tiffany Oliver conducting research to find a correlation between the variation in Proline Rich Domain Containing 9 (PRDM9) and genome-wide recombination rates in humans. Her specific research interests include genetic causes of autism, ovarian and cervical cancer; as well as finding possible genetic counseling for such disabilities and diseases. Ariel is currently applying to Human Genetics PhD programs for Fall 2014.